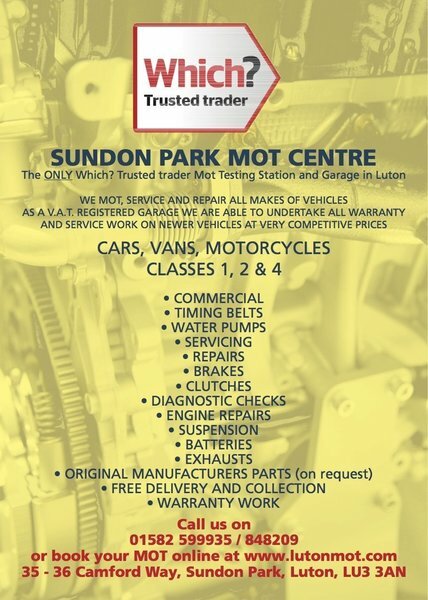 We are a family run business, well established in the Sundon Park area of Luton. We pride ourselves on our customer service, fairness and honesty. We have over 3000 loyal customers who come back to us year after year with their treasured vehicles. 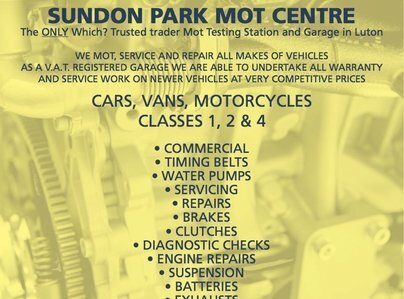 Our fully qualified team of mechanics and MOT testers have over 80 years hands on experience with all makes of vehicles and motorcycles. We do not charge to look at your vehicle and we will always call for permission before we commence work. We will also collect and deliver you or your vehicle free of charge for repairs and servicing. First class service on time with appointment and service. Super job. Great service, complete on time and good value. Excellent customer service over and above expectation. Thank you gang. They carried out an annual service on my car. They were able to do it on the date requested at a reasonable cost. They arranged for a specialist to look at the air conditioning which is not working for any apparent reason. Having used the same garage for years, decided to give more local garage a try. Only living a 10 minute walk I dropped wife's car off for a Noon booking at 11.30 and had a call to say all done by 12.25, fair advisory notice and passed without issue all for a good price. Yes I use to get cheaper but had found over the years there was generally always something else to pay. Will definitely be having all 3 cars in our household MOT'd and serviced here. Would recommend others to also try here. Very impressed with service from start to finish. Fast response to an initial online enquiry followed by an efficient job. Excellent communication and will use them again. The mechanic turned up exactly on time and was most polite. The fault with the vehicle was dealt with speedily and most professionally. Collected car on time, phone call to update me on work, then a further call to say car was being returned. Good quick MOT and service. An excellent family run garage. Highly recommended for their fast, efficient and honest services provided. Good value for money. The team go above and beyond to help you. As usual I took my Fiesta for its MOT, it failed, but more importantly they were sensible/real failures. I do not want a dodgy car. Advice was given on sorting the issues.